FAL, a leading producer of wood components, introduces on its production floor a new Routech Oikos machining centre. FAL, an acronym which stands for Fabbrica Avvolgibili Lavis (or 'rolling shutters factory of Lavis'), is located in Lavis, near Trento. However, it no longer deals with shutters but focuses on wood lamella beams and X-LAM walls. Ezio Brugnera and Guglielmo Chistè founded the company back in 1962, first just selling and only later producing wood shutters. In 1979, FAL expanded its product line to include wood lamella beams. Once the production of shutters has been dropped – due to unsustainable competition with PVC shutters – FAL began producing prismatic matchboards for floors and cladding, machining roof trusses, planing construction boards and treating machined wood, all without neglecting its important marketing activities. In the early 1990s, Alessandro Chistè took over the company and launched an investment and technological upgrading programme that still continues today. We actually travelled to Lavis just to see the Routech Oikos machining centre – which has been installed and commissioned recently – in action. We met Alessandro Fondriest, General Manager, and Alessandro Chistè, Managing Partner and Technical Director. Accompanying us were Tommaso Martini, SCM Machining Centres Carpentry Unit Manager, and Paolo Forza, SCM Product Area Manager. We asked Tommaso Martini to comment on the current situation of the wooden construction market, which has shown a general positive trend and has seen the most dynamic and better positioned companies gain solid advantage which was immediately translated into greater willingness to invest in technology. "The current market," said Martini, "is in solid growth, especially with regard to X-LAM structures. Companies in our industry demand high-tech solutions that combine precision with flexibility – because the design phase these days is wide open and with very few limits set on it – and machines need to be capable of responding flexibly to such needs." And Alessandro Fondriest, FAL General Manager, added: "We are leaving behind traditional constructions and follow the market, where diverse needs coexist. Our challenge is to convince the final customer to choose wood for constructions, for extra stories and for extensions. The tragic earthquake last year in central Italy resulted in growing attention to, interest in and awareness of the potential in this industry sector. I can confirm that market needs are becoming more and more complex, also regarding aesthetics. The final customer asks for visible interior roof trusses, in added stories, that are elegant and finely-finished as decorative elements. The machine ends up replacing the manual work of a carpenter to ensure the required results." "In this regard," Tommaso Martini asserted, "all phases of shipping and handling the trusses are important in ensuring maximum care and preventing any damage. Machining strategies are important as well: having a spindle that can handle different tools according to required rotations and strategies helps you get the finest finishing quality." "This is the first Routech Oikos machining centre to be installed at FAL, for processing walls and beams up to 1,250 millimetres wide," explained Paolo Forza. "It is extremely flexible and comes with an electro-spindle equipped with an on-board tool changer that allows it, thanks to its geometry, to machine all parts of the workpiece without needing to turn it around. This of course leads to greater machining precision. Beam loading and positioning systems are based on the concept of centring it, which in turn provides greater precision. The machine also comes with a laser system (mounted on the spindle) that reads in real time and at every instant the actual dimension of the workpiece; this helps solve problems caused by incorrect or inconstant measuring of beam dimensions. 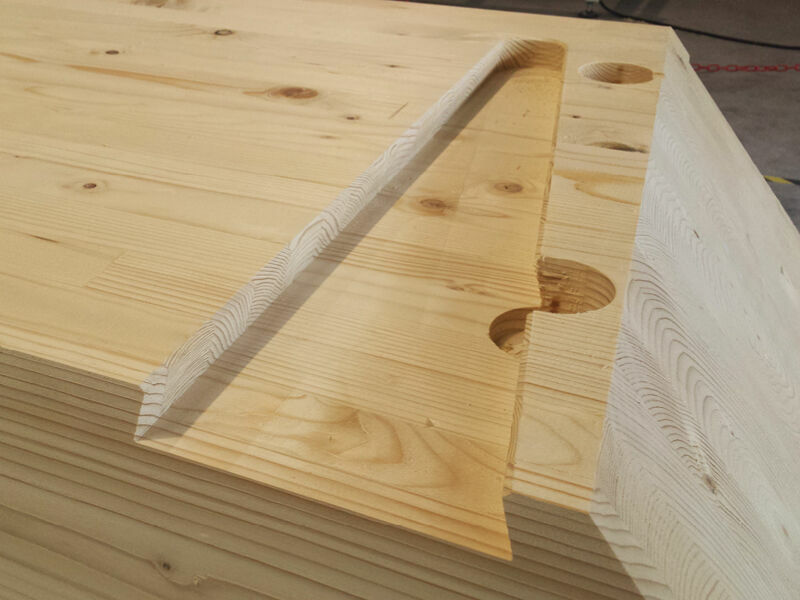 Machined workpieces (especially dovetail joints) will always have the same size thanks to this innovative system. 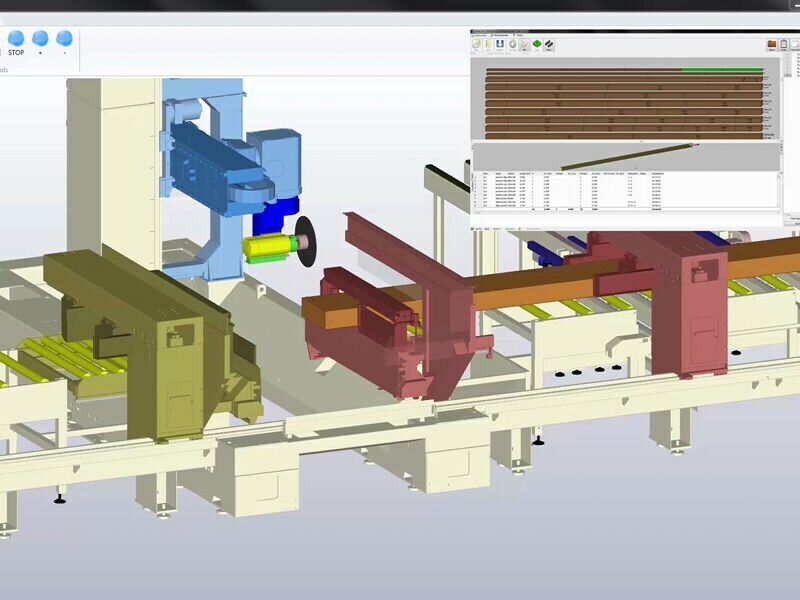 It's a flexible machine which, with its various accessories, can handle any type of machining – all controlled by our software based on the BTL standard, a commonly used free standard that allows processing data from any source and thus can instantly transform a design plan into a machine programme. This is true for processing both beams and walls." 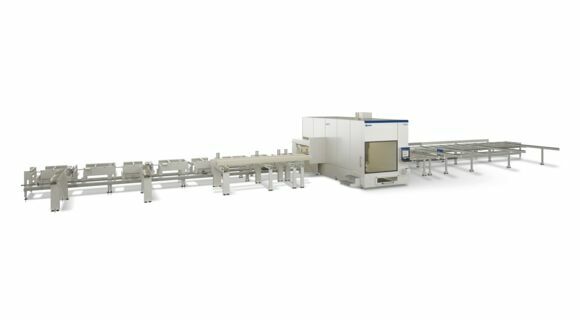 Tommaso Martini continued: "Another valuable feature of the Routech machining centre is its nesting capabilities, which allow the creation of various shapes from single panels that can then be used individually." And Alessandro Chistè added: "What we have appreciated the most were the machine's precision, flexibility and versatility. Also important to us was the easy and fast availability of service and problem solving whenever needed: in other words, the tight collaboration between company and customer." Paolo Forza added, for our benefit, a few more details regarding the collaboration between FAL and SCM: "FAL needed a flexible and high-performance machine and we had an opportunity to see such a machine in action at Routech and at another customer that had been using it already. This confirmed for us the fact that the market was changing and now demanded ever more flexible, high-performance machines with a competitive price-quality ratio. The tests we ran were more than satisfactory and today FAL operates using Italian technology, demonstrating it is a large group that is as good as its German competitors." "It is not surprising," added Tommaso Martini, "that we are now vigorously expanding into international markets. In fact, the markets are growing all around the world, not just in Central Europe. The potential in the Oikos machining centre is great and most of it is still to be discovered, mostly through increased use of software." "In this context," responded Forza, "we are working on such applications with great commitment, having already hired a carpenter who has high software proficiency and thus can improve machine software applications." "Today it is important," concluded Alessandro Chistè, "to be aware of the increasingly more complex modelling required by the market and the growing demand for combinations of wood, metal and other materials. And the Routech machining centres allow us to fully satisfy every new request."